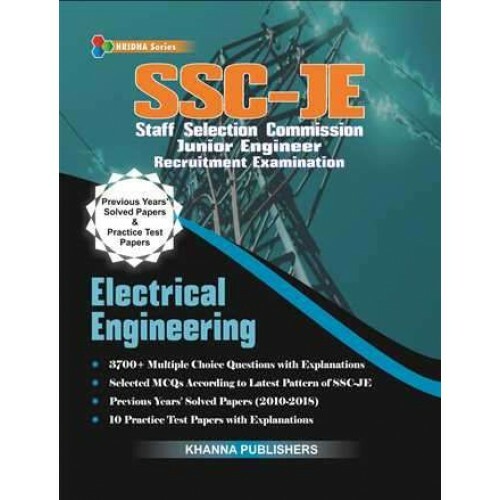 Preface The book has been designed as per the latest syllabus prescribed for SSC-Junior Engineer Examination. SSC-JE is conducted every year by Staff Selection Commission for the recruitment of Junior Engineer for government departments such as CWC, MES and CPWD. We, as a leading publisher in technical books, made an attempt to provide the complete preparation book with 9 years solved papers and 10 solved practice test papers. These practice test papers help students to learn and evaluate their skills on the subject. Each paper covers the important sections of this examination- General Intelligence and Reasoning, General Awareness and Electrical Engineering. This book will serve the purpose for the students who are preparing for Junior Engineer Examinations. The main objective of this book is to guide the students about the technical questions asked in the previous years' examinations. Table of Contents * Solved Paper- 2018 (Set-1) and (Set-2) * Solved Papers 2017, 2015, 2014, 2013, 2012, 2011, 2010, *Practice Test Papers Set-1 to Set-10.